The well-known tipster Ishan Agarwal has announced on Twitter that he has found out when the new OnePlus devices will be unveiled: May 14. This has not been confirmed by the OEM; however, the date is in line with its launch schedule from last year. 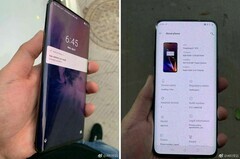 According to rumors, this year will see multiple variants of the device in question. The OnePlus 6T's successor (or, possibly, successors) will launch on May 14, 2019. At least, this is what the leaker Ishan Agarwal appears to have heard. However, there is as yet no additional evidence for this rumor. Agarwal also claims to be responsible for purported material that points to a new model name for OnePlus this year (the 7 Pro). Should both of these leaks prove accurate, it may mean that OnePlus will unveil 3 separate SKUs on May 14: the 7, 7 Pro and 7 Pro 5G. This would be a departure from the OEM's normal practice of releasing one device in the approximate mid-year, then a more extensive variant in terms of specs some months later with the suffix 'T'. However, OnePlus did take a step beyond this regular schedule with its additional release, a 6T McLaren Edition, last year. Therefore, there is no reason to think they may not be able to manage multiple different variants this year. In addition, it has locked itself into releasing a 5G-capable model by promoting this prospect since the end of last year in any case.